Restrict Microsoft Network Policy Server (NPS) to only trust client certificates from a given CA? I'm working on an install of a Microsoft Network Policy Sever (NPS) / RADIUS server for controlling access to corporate Wi-Fi using 802.1x / WPA2-Enterprise - using client certificates for authentication. My concern here is the opposite, however. How can the NPS be restricted to only accept client certificates from our own CA? It doesn't provide a similar dialog for "Validate client certificate", in which I could hopefully choose only our own internal CA. Under the NPS network policy, Constraints, Authentication Methods, EAP Types - we can specify the server certificate that is presented. This server identifies itself to callers before the connection is completed. Select the certificate that you want it to use as proof of identity. However, there is no setting visible as there is on the client side (above), which could be used to restrict which client certificate CAs are trusted. With OpenVPN, FreeRADIUS, etc., specific trust anchors can be specified at the server-side. Call me paranoid, but should the same not be able to be configured within NPS? As-is, in addition to our own internal CA, we're also trusting any certificates that may be issued by the default trusted root CAs (AddTrust, DigiCert, Equifax, Microsoft, Thawte, VeriSign, etc.). This may be acceptable for trusting external web servers, from internal servers where web browsing is forbidden / prevented. However, for purposes of client authentication on a wireless gateway - a breach by an otherwise unnecessary CA here could allow for unauthorized access to an internal network. Removing other CAs from the NPS servers might work, but I question if this is supported? Are there any options to restrict which user certificate CAs are trusted - similar to other RADIUS providers, or as available for client-> server trust (but for server -> client trust)? Especially if no good options for the above, are there any other mitigating factors that can / should be considered? (I don't see any available options for multi-factor authentication here, etc. - though we'd want to keep anything here transparent to end-users.) If nothing else, possibly some sort of authentication proxy that could filter the EAP requests before even being presented to NPS? I'm not an NPS expert but if you're using RADIUS with EAP-TLS you can configure your EAP-TLS policy to require a custom Enhanced Key Usage. Only certificates issued by your private PKI would contain this custom EKU so only those certificates would be accepted. 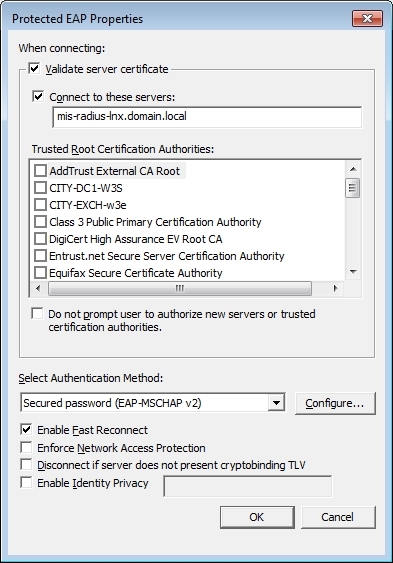 You'd create the custom EKU on your CA and add it as an Application Policy to your certificate template, then add that custom EKU to your EAP-TLS settings on the RADIUS server. As an aside, Enterprise Root CAs are a horrible idea from a security perspective. No, NPS simply does not support this (!) - as per incident number 117021015302705 that was opened 2017-02-10 with Microsoft Support. The only advice they were able to offer was to remove the default root CAs from the server(s), as I had eluded to in the question - but would not expand upon if this would be considered supported, nor what issues could arise from this within Windows itself. If anyone at Microsoft runs across this and can further escalate or respond to this, please do - either through this post, the original incident, or my contact information on the incident. Not the answer you're looking for? Browse other questions tagged certificates certificate-authority microsoft radius wpa2-eap or ask your own question. Can Passpoint X.509 certificates be used to MITM SSL connections on Passpoint networks? Certificate validation to multiple Root Certificates?